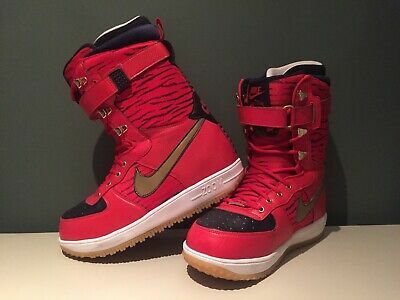 Rare Winter 2009 release pro-rider Zoom Force 1 snowboard boots. Red with tiger print design, black and gold accents, and tiger rabbit detail on back. Other features include red laces, golden eyelets and black leather toe cap. Unisex. Some normal signs of wear and tear (e.g. on tongue and laces - please see photos) but these are great statement boots for the mountain. Very comfortable, good quality, 100% authentic. Selling as I am moving abroad. Please get in touch if you have any questions :) Please contact me to discuss postage to outside the UK.